Ingredients: Water (Aqua), Alcohol, Sodium Potassium Aluminum Silicate, Glycerin, Prunus Amygdalus Dulcis (Sweet Almond) Oil, Persea Gratissima (Avocado) Oil, Cetearyl Alcohol, Mica, Macadamia Ternifolia Seed Oil, Silica, Simmondsia Chinensis (Jojoba) Seed Oil, Butyrospermum Parkii (Shea) Butter, Calendula Officinalis Flower Extract, Anthyllis Vulneraria Extract, Cocos Nucifera (Coconut) Oil, Bentonite, Fragrance (Parfum), Sodium Cetearyl Sulfate, Xanthan Gum, Citric Acid, Daucus Carota Sativa (Carrot) Root Extract, Iron Oxides (CI 77491, CI 77492, CI 77499), Titanium Dioxide (CI 77891), Zinc Oxide (CI 77947) Also contains components of natural essential oils: Limonene, Geraniol, Linalool, Citronellol, Benzyl Benzoate, Benzyl Salicylate, Farnesol, Coumarin, Citral, Eugenol. 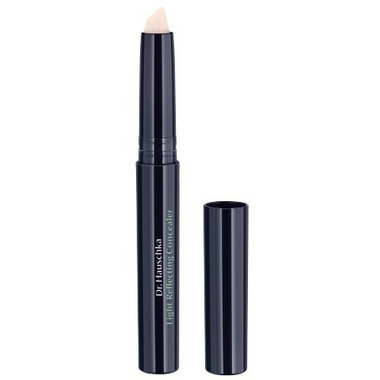 This concealer does not settle into the fine lines around the eyes. It does not really hide the dark circles, but it does add some brightness.